9/11 Truth is gaining steam in North Carolina as "Experts Speak Out" airs on local television stations throughout the state. 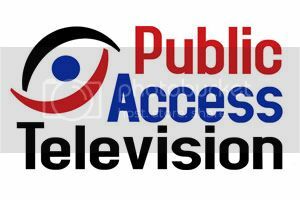 I (RL McGee) put this documentary on public access station GPAT-23 in Greenville / Pitt County last week. It will run for several weeks at various time spots. This was super-easy to do. There was no annual fee to become a producer and no orientation class to attend. I didn't even have to mail them a DVD since the station agreed to download the program from online! I just filled out 2 forms (Local Producer form and Program form) and mailed them in. Then I emailed the website for accessing the 1 hour version of ESO. It has also recently aired in Chapel Hill, Carrboro and Durham thanks to Bette Smith. Starting in Chapel Hill in late October, The People's Channel has shown this breakthrough documentary by AE911Truth continuously in Chapel Hill / Orange County, and then its sister station aired the documentary in Carrboro in early November. Soon after Durham Community Media came on board and has been airing "Experts Speak Out" since mid-November in Durham County, NC. Three years ago I wrote a column headlined “PBS, Yes and No.” It dealt with controversial episodes in which the public had reason to believe PBS was associated in some fashion with a certain television program yet PBS, as a broadcasting service, didn’t have anything to do with it. WORLD PREMIERE TOUR "9/11: Explosive Evidence - Experts Speak Out"
AE911Truth is proud to announce the completion of the Final Edition of our milestone documentary, 9/11: Explosive Evidence – Experts Speak Out, and we are taking the film on the road with a whirlwind World Premiere Tour across the U.S., starting on May 21. 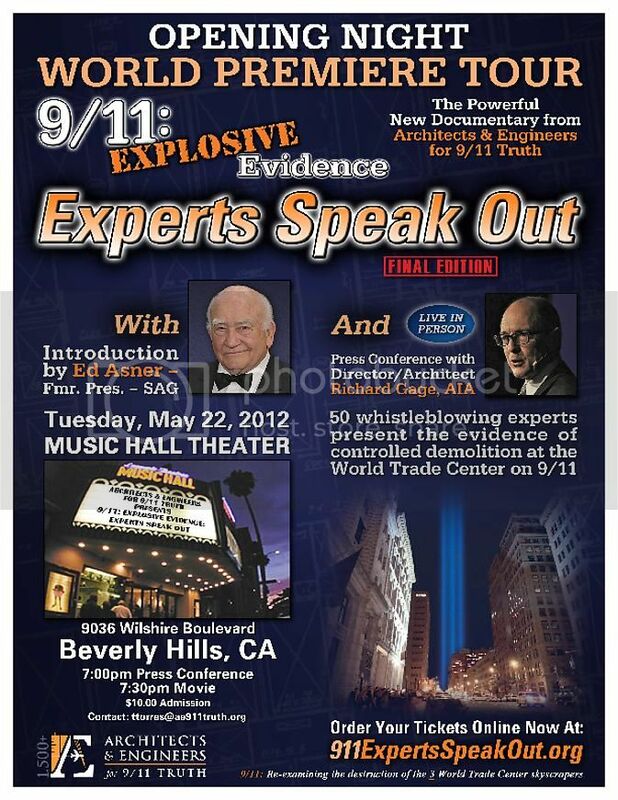 The director of Experts Speak Out, AE911Truth founder Richard Gage, AIA, will personally introduce this groundbreaking film at top venues in 30 cities nationwide and take questions from the audience after each screening. Tickets are on sale now, so make sure to buy yours before the events sell out. Join us in one of 30 cities near you on this tour, which begins in San Diego, CA, and covers 24 states from coast to coast. The official “Opening Night” of the tour will be in Los Angeles at the Beverly Hills Music Hall Theater on May 22. Famed actor Ed Asner, the star of our previous short-film hit, Architects & Engineers – Solving the Mystery of WTC 7, will join Gage at the kickoff Press Conference at 7pm, and will introduce the movie, which starts shortly thereafter. We will also be joined at the “Opening Night” premiere by veteran Hollywood actors John Heard and Judd Nelson. In addition, high-rise architect Robert McCoy, one of the respected building professionals featured in Experts Speak Out, will be in attendance.